There is a new oral flea and tick product on the market and we are all very excited about it here at Friendship. 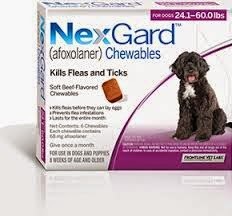 Nexgard is a monthly chew that protects dogs against fleas and ticks. It is absorbed into the blood stream and kills parasites when they bite your dog and begin a blood meal. Due to this mechanism of action you may still find dead ticks attached to your dog, the fleas probably just fall right off (Ick!). Like Frontline it does not offer any repellant protection, the bug has to feed before it can be killed. Unlike Frontline you don’t have to deal with the greasy spot they get on their fur after application or worry about how bathing and swimming will affect protection. We will not be selling Frontline Plus anymore but you can still find it online and at retail stores if that continues to be your product of choice. 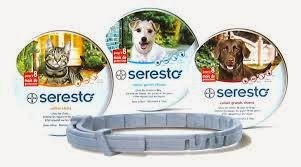 If you are interested in a product with repellant properties we also carry the Seresto collar for dogs and cats. This is worn all the time and lasts for five to eight months depending on how often your pet is bathed or enjoys a swim. My only complaint with this product is that I find the collar itself a bit unsightly on shorthaired dogs. This is a fairly superficial reason and should not detract you from considering it, especially if you have a hard time remembering to give the chew monthly. 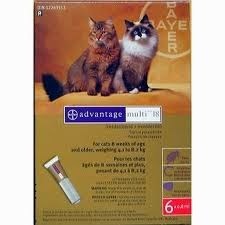 For parasite protection of kitties we will continue to sell Advantage Multi topical spot-on treatment that protects against heartworm, fleas, ear mites, roundworms and hookworms. I feel this or Revolution (we do not sell this particular product) are the best choices for cats because they provide heartworm prevention. Dogs of course get their monthly heartworm prevention in the form of monthly Heartgard chews. The products we sell at Friendship are a small subset of the multitude of monthly preventive products out there. If you have questions about any product in particular please don’t hesitate to discuss them with your veterinarian. I hope this helps you muddle through the options available for purchase at the hospital.